As payment methods have evolved from the traditional cash-based system to mobile systems, contactless cards are becoming more popular for their convenience and flexibility. This mobile payment system stores your credit and debit card information in a mobile app, so you can securely make purchases at any store that has a contactless credit card terminal by just waving your smartphone across a reader. The information on your debit or credit cards remains private, although it is stored in a mobile payment app built by your financial institution or by an approved third party, such as Apple Pay, Android Pay, and Samsung Pay. You can include as many cards as you wish, so long as the issuers of the cards are in sync with your mobile payment app. Contactless cards in mobile payment systems make use of NFC technology, or “near-field communication.” As the name implies, the device must be close enough to the NFC reader to capture the electromagnetic wave emanating from it, which is a short radio frequency that will establish the connection. So your smart device must be NFC enabled—and most smartphones manufactured in recent years are—and the merchant must have an NFC terminal or reader. The NFC technology is akin to that of Bluetooth and Wi-Fi. All three can be used to connect devices together, but the former does so at very close range. The NFC technology evolved from RFID (radio frequency identification) technology, which has a wider electromagnetic field range that is employed in the creation of tags for smart products. To make a mobile payment using a stored contactless card at any store that accepts this system, all you need to do is open the mobile app on your smartphone. Then, bring it close to the terminal (about an inch or two away) and affirm your identity with your fingerprint or by entering your private security PIN. There’s no need to insert, swipe, or even carry around your cards. When this is done, a connection is established between your phone and the contactless reader, allowing the terminal to communicate with the card stored on your phone and complete the transaction. Once the payment has been made, the terminal sends a notification to your phone confirming that the payment has been successful, and you’ll be billed accordingly. 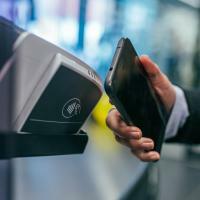 Mobile payments have come to stay, in spite of some security challenges. Like any other payment method containing your sensitive financial information, it’s important for contactless card technology to take security testing measures in order to stay on top of vulnerabilities. But as more customers and vendors adopt this convenient technology, it should only continue to improve. David Smith is a cryptographer with 12 years of experience in both the public and private sectors. He is currently working in Cardzgroup his expertise includes: system design and implementation with contact and contactless smart cards, smart card personalization, mobile payments, and general knowledge and experience with APAC market trends and consumer preferences.